Welcome to the Ford Classic Cars page, our dedication to some of our customers and their beautiful, vintage cars! This page is a way for us to share some of the great photos, stories and experiences that we have accumulated throughout the years and a way for our customers to shine the spotlight on their classic cars. 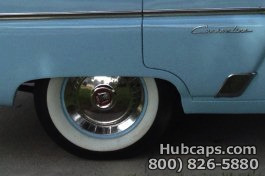 The wheelcovers gracing these Fords were restored by our on site team of experts and we'll admit it, we kind of want to brag about amazing work that we produce. At least this way, you can all enjoy it too! Hubcaps.com has been in business since 1979 and a portion of our inventory is made up of rare, vintage pieces of history that we restore on a daily basis for our customers. Please feel free to browse and thank you so much for your interest! Please take a look at the 1970 Ford Ranger that now has fully restored hub caps to add that last special touch. For those of you who love the quality of work we can produce, contact us for more information. See more here! Look at this 1963 Ford Fairlane 500 that we helped recently! This car is a daily driver that turns heads wherever it goes, especially with it’s new set of restored hubcaps. Don’t miss out, it truly is a beautiful automobile! Click to continue! 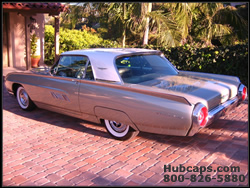 Get a look at this customer’s 1964 Ford Thunderbird that we reconditioned a set of hubcaps for! In its current home in Saudi Arabia, it draws looks and pictures wherever it goes, we’re not surprised! Click to see more!